Hitting sand shots with spin will stop the ball quickly on the putting surface. Though golfers try to avoid it, inevitably they will end up in a greenside sand trap. 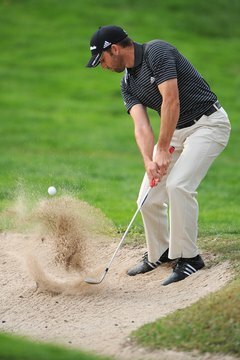 While getting out of sand traps can be a challenge for some, once the basics of escaping from a sand trap have been mastered, golfers can move to more advanced bunker shots. Golfers can add spin to bunker shots to stop the ball closer to the hole and lower scores. Golfers can get out of greenside bunkers in two basic ways. Short-game expert Dave Pelz calls the first method the “dig and push,” where golfers hit the sand far behind the ball and blast the ball out. The other is the “scoot and spin” where the clubface is open and skims under the ball, hitting the ball high with plenty of spin. In this method, the ball will hit the green once or twice then stop quickly. Although the normal golf stance has golfers line up square to the target, a shot that will produce spin from the bunker requires golfers to line up with the front foot and shoulders slightly open. When taking your stance, dig your feet into the sand a bit. This will ensure that the feet will not move during the shot, while providing a solid base and allowing the club to slide under the ball more easily. The clubface should be held slightly open. This will allow it to slide more easily under the shot, creating loft and little spin. The open clubface also complements the open stance by allowing the shot to be hit at the target. The rounded base of the sand wedge will also keep the wedge from digging into the sand. Take a swing with an even tempo and focus on making contact with the ball about an inch or two behind the ball. In a sand shot, the wrists will hinge earlier and create a slightly steeper swing arc than normal. Swing with an even tempo and resist the urge to decelerate on the downswing. Decelerating will only increase the chance of leaving the ball in the bunker. Swing through the contact and hold the follow through. If you have executed the shot correctly, the ball will stop quickly when hitting the green. No matter which method you select for hitting from greenside bunkers, remember to hit the sand first. Hitting the ball first allows for little distance control and will likely result in the ball being hit thin across the green. Also, the rules of golf prohibit placing the club in the sand before hitting a shot from the sand. Placing the club in the sand results in a two-stroke penalty. How Do I Use a Golf Gap Wedge?